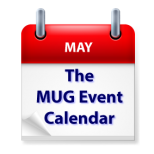 This week’s MUG Event Calendar is highlighted by a Skype visit by Bob “Dr. Mac” LeVitus to a Pennsylvania group. Other meetings of note include a focus on Pages at one California group, an introduction to iCloud at another, and a discussion of the Internet of Things at an Arizona group.